RIPA represents companies in North America and around the world that offer sustainable industrial packaging solutions to their customers. Members produce reconditioned and new steel, plastic, and fiber drums, as well as intermediate bulk containers. At RIPA’s request, Transport Canada, the Canadian equivalent of U.S. 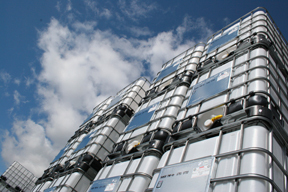 DOT, has renewed the “Equivalency Certificate” SU 11819 which facilitates the transport of emptied IBCs together with emptied drums to a reconditioner provided certain conditions are met. Those that qualify for the certificate can simply use a DANGER vehicle placard when a shipment includes two or more emptied IBCs – saving considerable time and effort hanging placards for each hazard class the IBCs may have held. Mr. Barry Wingard, Minority Owner and Senior Operations Director, Container Life Cycle Management, LLC, was recently selected by his industry peers to receive the 2018 Morris Hershson Award of Merit. Mr. Wingard was bestowed the award at the Houstonian Resort and Spa on October 25, 2018 at the 77th Annual Conference of the Reusable Industrial Packaging Association. RIPA presents the prestigious award to an individual for “distinguished and longstanding service” to the reusable industrial packaging industry. RIPA responded recently to U.S. DOT’s request for public and industry comment on DOT regulations that should be reviewed for potential withdrawal or revision. The DOT request is in response to an Executive Order from the White House issued soon after the inauguration last January. RIPA has focused on five areas of regulatory concern, a couple of which actually would require regulatory action to provide relief: one, to broaden options in leakproofness testing operations and, another, to make more practical the standard for adherents on steel drum surfaces after reconditioning. Other suggestions are to extend periodic testing of design types beyond the current annual basis, and to move on RIPA’s past requests that emptied IBCs be granted similar relief as emptied drums when shipping to a reconditioner or remanufacturer. See HERE this report commissioned by RIPA in 2014-15, conducted by Ernst & Young, comparing “carbon footprints” (expressed as CO2 equivalents) for reconditioned vs. new packaging solutions. Trouble viewing the PDF in your browser? You may need to right click the link , save the file (to your desktop or a particular folder), and then open. Certain browsers may be incompatible. See HERE the RIPA “Green Packaging Calculator” which can calculate carbon footprints associated with the use of new vs. reconditioned industrial packagings. Open the front page of the Calculator and click through this series of tabs: File –> Options –> Trust Center –> Macro Settings –> check Enable All Macros –> OK –> OK. Please contact RIPA with any questions or concerns. A 1999 “life cycle inventory” (LCI) conducted for the International Confederation of Container Reconditioners (ICCR) – of which RIPA is a part. The LCI was conducted by Franklin Associates and quantifies overall energy needs, waste generation and emissions for 1000-drum control samples in both single-trip and multi-trip scenarios. The findings show significant savings in the multi-trip scenario. Nearly two decades ago, at the Earth Summit in Rio de Janeiro, the United States joined other nations in approving the United Nation’s Framework Convention on Climate Change (FCCC). The FCCC represented the first international effort to develop a comprehensive approach to reducing greenhouse gas emissions and combat the threat of global warming. Not long thereafter, the Kyoto Protocol was negotiated, establishing greenhouse gas emission reduction targets for industrialized countries. Although approximately 100 nations have ratified the Kyoto Protocol, some of the world’s most developed countries, including the U.S. and Australia, have not done so. Despite not having signed the Kyoto Protocol, the U.S. has evolved a proactive approach to climate change issues, involving governmental and private sector initiatives. At the federal level, the government supports stronger regulations on large emitters of greenhouse gases (e.g., utilities) and a range of volunteer strategies that help reduce GHG emissions (e.g., building codes, EPA’s “Climate VISION” initiative). Various federal agencies, including the Environmental Protection Agency (EPA), and the Departments of Energy and Agriculture, have developed targeted programs to promote and encourage private sector greenhouse gas reduction efforts. Chief among these are EPA’s “Climate Leaders” program and DOE’s Voluntary Reporting of Greenhouse Gasses Program, established under Section 1605(b) of the Energy Policy Act of 1992. Working in cooperation with EPA, more than half the states have established Climate Change Action Plans establishing greenhouse gas mitigation policies and programs. Private sector initiatives focusing on greenhouse gas emission reduction programs are proliferating. Industry organizations representing automobile manufacturers, chemical producers, petroleum manufacturers and iron and steel producers, have established voluntary GHG emission reduction targets for its members. These and other organizations have accepted the principle that excessive levels of greenhouse gases in the atmosphere will negatively impact the environment and, over time, reduce national and international economic development opportunities. They also believe that a voluntary response is the best way to address greenhouse gas issues at this time. The Reusable Industrial Packaging Association (RIPA) promotes policies and practices that encourage additional use and reuse of reusable industrial and transport packaging. Packaging reuse reduces greenhouse gas emissions and RPCCA seeks to encourage greater use of such packagings by corporations where practical and feasible. What is Reusable Industrial and Transport Packaging? This definition does not address issues of material of construction and capacity, since the capacities of packagings used for industrial purposes can range from a few ounces to many thousands of gallons, and such packages are produced from a wide range of materials, including metal, wood and plastics. Packaging intended to contain one or more articles or packages or bulk material for the purposes of handling and/or distribution. This definition encompasses such items as plastic trays and pallets produced from plastic or wood. How Does Industrial and Transport Packaging Reuse Reduce Greenhouse Gas Emissions? Reduces energy consumption. Reuse saves energy by reducing raw material acquisition requirements, limiting production of new packagings and eliminating much of the transportation-related impacts associated with each of these functions. Reduces solid waste production. Solid wastes are generated during each phase of the production process, from the extraction of raw materials to the fabrication of new packagings. Most of these wastes are reduced or eliminated when industrial packagings are reused. Reduces atmospheric and waterborne emissions. Atmospheric and waterborne wastes are generated as part of the production process. Significant portions of such wastes are eliminated by packaging reuse. What is the Impact of Industrial and Transport Packaging Reuse on Greenhouse Gas Emissions? In the United States, it is estimated that total greenhouse gas emissions are reduced by approximately 2 billion pounds (900,000 tons) per year, based on the amount of reusable packaging already in use. RIPA believes this number could be significantly increased if industrial packaging users made concerted efforts to use greater numbers of reusable packagings. For nearly three-quarters of a century, the Reusable Industrial Packaging Association (RIPA) has been the trade association representing North American reconditioners, manufacturers and distributors of reusable industrial packaging. RIPA represents over 90% of the industrial packaging reconditioning industry in North American including many of the world’s leading manufacturers of steel, plastic and fiber drums, as well as intermediate bulk containers. The RIPA membership also includes many of the leading suppliers of packaging parts and accessories. As a condition of membership, all RIPA members agree to conform to a Code of Operating Practice, which sets forth specific guiding principles for operations, packaging reuse and recycling. These guidelines are intended to improve the industry’s performance in the areas of regulatory compliance, environmental management, waste reduction and recycling. RIPA is the industry’s information clearinghouse. The association sponsors workshops and meetings that provide information about issues of importance to the industry’s well being and continued success. The group’s Annual Conference, Technical Conference and compliance workshops help ensure that members understand key issues affecting their businesses, and can learn about technical and business developments. The association publishes an industry newsletter, “Reusable Packaging Today,” and distributes Special Bulletins on issues of immediate concern to members. RIPA is a founding member of the International Confederation of Container Reconditioners (ICCR), which represents the global reconditioning industry in regulatory and standards-setting forums throughout the world. Thank you for your interest in joining the Reusable Industrial Packaging Association (RIPA)! RIPA is the premier trade association for reconditioners, manufacturers and distributors of reusable industrial packaging in North America. RIPA offers its members outstanding technical programs, compliance assistance, industry news and issue advocacy. RIPA is the best source of regulatory, technical, legal and business information. Our monthly newsletter, “Reusable Packaging Today”, is read by reconditioners, manufacturers, regulators and packaging users globally. Our website was the first of its kind in the industrial packaging industry and is a great source of information. RIPA’s meetings give you access to a wide range of important information about emerging business trends, new technologies and industry developments. Our Steel Drum, Plastic Drum, Fiber Drum, IBC and Flexible IBC Product Groups allow members to focus on the issues related to specific packaging products. Every RIPA member can participate in any one or all of these groups. Each Product Group sets its own agenda and can make policy recommendations to the RIPA Board of Directors. Supplier / Associate Members also participate fully in the Product Groups and also elect a representative to the Board of Directors. This category of membership generally includes businesses that provides parts, supplies, and services to container reconditioners and manufacturers. RIPA is a valuable source of regulatory compliance assistance. Members have access to a staff that knows the fine points of U.S. and international standards. Also, RIPA is the voice of the reusable industrial packaging industry before regulatory agencies, the public and the various international standards-settings organizations. The association works on members’ behalf to help shape laws, regulations and standards that support the manufacture and reuse of reusable packaging. RIPA also supports the international association for reconditioners which conducts important work on standards and policies that affect packaging and reconditioners worldwide. And finally, RIPA interacts with packaging user groups and offers all packaging users clear and accessible information on reusable industrial packaging. RIPA holds an annual conference each fall and a technical conference each spring. At each fall conference, Supplier Members are invited to set-up displays – free of charge – in the Exhibition Hall adjacent to the main meeting room. More information on upcoming conferences and other events can be found under “Conferences” on this website. Linked at the top of this page are membership applications for the various categories of membership. See the back of the applications for the dues level or dues scale. For reconditioners and distributors, applications require the accountant’s certification of revenue included in the form. Officially, there is a 30-day period of review for all applications. However, all applicants are added to RIPA’s e-mail lists for important mailings as soon as applications are received. If you have any questions, please contact us at (301) 577-3786. Also, you can simply fax the membership application to (301) 577-6476. Thank you!